Detective Rust Cohle: Life's barely long enough to get good at one thing. So be careful what you get good at. Last night's episode,"After You've Gone" in my opinion, was more a laid back attitude. I wanted to see more aggressiveness. The best fire for me was when Cole told Maggie to leave the bar. Proud of you Cole. I was surprised the viewers could not see the picture Cole showed Marty of the ritual. We can take it. I really thought it was a picture of Marty's daughter, especially because of the tiara she threw in the tree. I hope this last episode is a continuation to a next season thriller. To tie this "Yellow King" finale is one more episode..no way. You gotta leave room for a sequel. We know the interrogating officers (Potts and Kittles) were not apart of a conspiracy because they did not recognize the scarred face man on the riding lawn mower. I predict the Pastor (Joel)Theriot maybe the Yellow King. The again Marty will not surprise me if he is a part of the conspiracy, especially when he went bide farewell to Maggie. Did he know Cole was getting close? Then again Cole may know it is Marty and playing him. 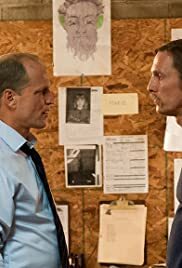 True Detectives is not predictable...that's what make it a great show! 18 of 47 people found this review helpful. Was this review helpful to you?